The Community is a Contracting Party to the United Nations Convention on the Law of the Sea of 10 December 1982 (Unclos), has ratified the United Nations Agreement for the Implementation of the Provisions of the United Nations Convention on the Law of the Sea of 10 December 1982 relating to the Conservation and Management of Straddling Fish Stocks and Highly Migratory Fish Stocks of 4 August 1995 (UN Fish Stocks Agreement) and has accepted the Agreement to Promote Compliance with International Conservation and Management Measures by Fishing Vessels on the High Seas of 24 November 1993 of the Food and Agriculture Organization of the United Nations (FAO Compliance Agreement). Those provisions predominantly set out the principle that all States have a duty to adopt appropriate measures to ensure sustainable management of marine resources and to cooperate with each other to this end. The objective of the common fisheries policy, as set out in Council Regulation (EC) No 2371/2002 of 20 December 2002 on the conservation and sustainable exploitation of fisheries resources under the common fisheries policy (3), is to ensure exploitation of living aquatic resources that provides sustainable economic, environmental and social conditions. Illegal, unreported and unregulated (IUU) fishing constitutes one of the most serious threats to the sustainable exploitation of living aquatic resources and jeopardises the very foundation of the common fisheries policy and international efforts to promote better ocean governance. IUU fishing also represents a major threat to marine biodiversity which needs to be addressed in accordance with the objectives set out in the Communication from the Commission — Halting the loss of biodiversity by 2010 — and beyond. The FAO adopted in 2001 an international plan of action to prevent, deter and eliminate illegal, unreported and unregulated fishing, which the Community has endorsed. Furthermore, regional fisheries management organisations, with the active support of the Community, have established an array of measures designed to counteract illegal, unreported and unregulated fishing. In line with its international commitments, and given the scale and urgency of the problem, the Community should substantially enhance its action against IUU fishing and adopt new regulatory measures designed to cover all facets of the phenomenon. The action by the Community should be targeted primarily at behaviour falling under the definition of IUU fishing and which causes the most serious damage to the marine environment, the sustainability of fish stocks and the socioeconomic situation of fishermen abiding by the rules on conservation and management of fisheries resources. In line with the definition of IUU fishing, the scope of this Regulation should extend to fishing activities carried out on the high seas and in maritime waters under the jurisdiction or sovereignty of coastal countries, including maritime waters under the jurisdiction or sovereignty of the Member States. In order to properly address the internal dimension of IUU fishing, it is vital for the Community to adopt the necessary measures to improve compliance with the rules of the common fisheries policy. Pending the revision of Council Regulation (EEC) No 2847/93 of 12 October 1993 establishing a control system applicable to the common fisheries policy (4) provisions to this end should be inserted in this Regulation. Community rules, and in particular Title II of Regulation (EEC) No 2847/93, provide for a comprehensive system designed to monitor the legality of catches from Community fishing vessels. The current system applying to fishery products caught by third country fishing vessels and imported into the Community does not ensure an equivalent level of control. This weakness constitutes an important incentive for foreign operators carrying out IUU fishing to trade their products in the Community and increase the profitability of their activities. As the world's largest market for, and importer of fishery products, the Community has a specific responsibility in making sure that fishery products imported into its territory do not originate from IUU fishing. A new regime should therefore be introduced to ensure a proper control of the supply chain for fishery products imported into the Community. Community rules governing access to Community ports of fishing vessels flying the flag of a third country should be strengthened with a view to ensuring a proper control over the legality of the fishery products landed by fishing vessels flying the flag of a third country. This should notably imply that access to Community ports is only authorised for fishing vessels flying the flag of a third country which are able to provide accurate information on the legality of their catches and to have this information validated by their flag State. Transhipments at sea escape any proper control by flag or coastal States and constitute a usual way for operators carrying out IUU fishing to dissimulate the illegal nature of their catches. It is therefore justified for the Community to authorise transhipment operations only if they occur within the designated ports of Member States, in ports of third countries between Community fishing vessels, or outside Community waters between Community fishing vessels and fishing vessels registered as carrier vessels under the auspices of a regional fisheries management organisation. It is appropriate to lay down the conditions, procedure and frequency according to which checking, inspection and verification activities shall be carried out by Member States, on the basis of risk management. Trade with the Community in fishery products stemming from IUU fishing should be prohibited. In order to make this prohibition effective and ensure that all traded fishery products imported into or exported from the Community have been harvested in compliance with international conservation and management measures and, where appropriate, other relevant rules applying to the fishing vessel concerned, a certification scheme applying to all trade in fishery products with the Community shall be put in place. The Community should take into account the capacity constraints of developing countries for the implementation of the certification scheme. It is appropriate that, under this scheme, a certificate be required as a precondition for the import of fishery products into the Community. That certificate should contain information demonstrating the legality of the products concerned. It should be validated by the flag State of the fishing vessels which caught the fish concerned, in line with its duty under international law to ensure that fishing vessels flying its flag comply with international rules on conservation and management of fisheries resources. It is essential that this certification scheme apply to all imports of marine fishery products into the Community and exports from the Community. This scheme should also apply to fishery products which have been transported or processed in a country other than the flag State before reaching the territory of the Community. Specific requirements should therefore apply with respect to those products, in order to guarantee that the products arriving into the territory of the Community are not different from those the legality of which has been validated by the flag State. It is important to ensure an equal level of control for all imported fishery products, without prejudice to the volume or frequency of trade, by introducing specific procedures for granting the status of approved economic operator. The exportation of catches from fishing vessels flying the flag of a Member State should also be subject to the certification scheme under the framework of cooperation with third countries. Member States into which the products are intended to be imported should be able to check the validity of the catch certificates accompanying the consignment and be entitled to refuse the importation where the conditions laid down in this Regulation with respect to the catch certificate are not met. It is important that checking, inspection and verification activities pertaining to fishery products in transit or transhipment be carried out primarily by the Member States of final destination in order to improve their efficiency. In order to assist control authorities within Member States in their tasks of monitoring the legality of fishery products traded with the Community, as well as to warn Community operators, a Community alert system should be established, designed to spread information, where appropriate, about well-founded doubts as to compliance by certain third countries with applicable conservation and management rules. It is essential that the Community adopt dissuasive measures against fishing vessels carrying out IUU fishing and which are not subject to appropriate action by their flag State in response to such IUU fishing. To this end, the Commission, in collaboration with Member States, the Community Fisheries Control Agency, third States and other bodies, should identify fishing vessels suspected of carrying out IUU fishing, on the basis of risk management, and the Commission should seek information from the competent flag State as to the accuracy of the findings. In order to facilitate enquiries pertaining to fishing vessels presumed to have carried out IUU fishing and prevent the continuation of the alleged infringement, those fishing vessels should be subject to specific control and inspection requirements by Member States. When, on the basis of the information obtained, there are sufficient grounds to consider that fishing vessels flying the flag of a third country have been engaged in IUU fishing and that the competent flag States have not taken effective action in response to such IUU fishing, the Commission should place those vessels on the Community IUU vessel list. When, on the basis of the information obtained, there are sufficient grounds to consider that Community fishing vessels have been engaged in IUU fishing and that the competent flag Member States have not taken effective action pursuant to this Regulation and to Regulation (EEC) No 2847/93 in response to such IUU fishing, the Commission should place those vessels on the Community IUU vessel list. With a view to remedying the absence of effective action by flag States towards fishing vessels flying their flags and placed on the Community IUU vessel list, and to restrict the continuation of fishing activities by those vessels, Member States should apply appropriate measures against those vessels. To safeguard the rights of the fishing vessels placed on the Community IUU vessel list and of their flag States, the procedure for the listing should give the flag State the opportunity to inform the Commission of the measures taken and, where possible, give the owner or operators concerned the possibility of being heard at each stage of the procedure and allow for the delisting of a fishing vessel when the criteria for its listing are no longer met. In order to provide for a single framework within the Community and to avoid proliferation of lists pertaining to fishing vessels involved in IUU fishing, fishing vessels included in the IUU lists adopted by regional fisheries management organisations should automatically be included in the corresponding list drawn up by the Commission. The failure by some States to discharge the duty incumbent on them under international law as flag, port, coastal or market States, to take appropriate measures to ensure compliance by their fishing vessels or nationals with rules on the conservation and management of fisheries resources is one of the main drivers of IUU fishing and should be addressed by the Community. To this end, in addition to its action at international and regional levels, the Community should be entitled to identify those non-cooperating States, on the basis of transparent, clear and objective criteria relying on international standards, and, after giving them adequate time and to respond to a prior notification, adopt non-discriminatory, legitimate and proportionate measures with respect to those States, including trade measures. It is for the Council to adopt trade measures in respect of other States. As the establishment of a list of non-cooperating States should entail trade counter-measures in respect of the States concerned, it is appropriate that the Council reserve itself the right to exercise implementing powers directly in this specific case. It is essential that nationals of Member States be effectively deterred from engaging in or supporting IUU fishing by fishing vessels flying the flag of third countries and active outside the Community, without prejudice to the primacy of the responsibility of the flag State. Member States should therefore put in place the necessary measures and cooperate between themselves and with third countries to identify their nationals carrying out IUU fishing, make sure that they are adequately sanctioned and verify the activities of their nationals involved with third country fishing vessels, outside the Community. The persistence of a high number of serious infringements against the rules of the common fisheries policy within Community waters or by Community operators lies to a large extent in the non-deterrent level of sanctions prescribed within Member States' legislation in relation to serious infringements to those rules. This weakness is compounded by the wide variety of sanctions levels across Member States, which encourages illegal operators to operate in maritime waters or the territory of the Member States where these are the lowest. To address this weakness, building upon the provisions set out in Regulations (EC) No 2371/2002 and (EEC) No 2847/93 in this area, it is appropriate to approximate within the Community the maximum levels of administrative sanctions foreseen in relation to serious infringements against common fisheries policy rules, taking into account the value of the fishery products obtained by committing the serious infringement, their repetition and the value of the prejudice to the fishing resources and the marine environment concerned, as well as to foresee immediate enforcement measures and complementary measures. In addition to behaviour constitutive of a serious infringement against rules on fishing activities, the conduct of business directly connected to IUU fishing, including the trade in or the importation of fishery products stemming from IUU fishing, or the falsification of documents, should also be considered as serious infringements requiring the adoption of harmonised maximum levels of administrative sanctions by Member States. The sanctions for serious infringements of this Regulation should also apply to legal persons as those infringements are committed, to a large extent, in the interest of legal persons or for their benefit. Provisions pertaining to sightings of fishing vessels at seas adopted within certain regional fisheries management organisations should be implemented in a harmonised manner within the Community. Cooperation between Member States, the Commission, and with third countries is essential to ensure that IUU fishing is properly investigated and sanctioned and that the measures laid down in this Regulation can be applied. A system for mutual assistance should be established to enhance such cooperation. In accordance with the principle of proportionality, it is necessary and appropriate for the achievement of the basic objective of eliminating IUU fishing to lay down rules on the measures foreseen in this Regulation. This Regulation does not go beyond what is necessary in order to achieve the objectives pursued, in accordance with the third paragraph of Article 5 of the Treaty. This Regulation identifies IUU fishing as a violation of applicable laws, rules or regulations of particular gravity, as it seriously undermines the attainment of the objectives of the violated rules and jeopardises the sustainability of the stocks concerned or the conservation of the marine environment. Given its restricted scope, the implementation of this Regulation must build upon, and be complementary to that of Regulation (EEC) No 2847/93, which establishes the basic framework for the control and monitoring of fishing activities under the common fisheries policy. Accordingly, this Regulation reinforces the rules of Regulation (EEC) No 2847/93 in the area of port inspections of third country fishing vessels, which are now repealed and replaced by the port inspection regime established in Chapter II of this Regulation. In addition, this Regulation provides for a regime of sanctions in Chapter IX that applies specifically to IUU fishing activities. The provisions of Regulation (EEC) No 2847/93 relating to sanctions remain thus applicable to violations of the rules of the common fisheries policy other than those addressed by this Regulation. The protection of individuals with regard to the processing of personal data is governed by Regulation (EC) No 45/2001 of the European Parliament and of the Council of 18 December 2000 on the protection of individuals with regard to the processing of personal data by the Community institutions and bodies and on the free movement of such data (6), which is fully applicable to the processing of personal data for the purposes of this Regulation, in particular as regards the rights of data subjects to access, rectification, blocking and erasure of data and notification to third parties, which have not in consequence been further particularised in this Regulation. 1. This Regulation establishes a Community system to prevent, deter and eliminate illegal, unreported and unregulated (IUU) fishing. 2. For the purposes of paragraph 1, each Member State shall take appropriate measures, in accordance with Community law, to ensure the effectiveness of that system. It shall place sufficient means at the disposal of its competent authorities to enable them to perform their tasks as laid down in this Regulation. 3. The system laid down in paragraph 1 shall apply to all IUU fishing and associated activities carried out within the territory of Member States to which the Treaty applies, within Community waters, within maritime waters under the jurisdiction or sovereignty of third countries and on the high seas. IUU fishing within maritime waters of the overseas territories and countries referred to in Annex II of the Treaty shall be treated as taking place within maritime waters of third countries. ‘consignment’ means products which are either sent simultaneously from one exporter to one consignee or covered by a single transport document covering their shipment from the exporter to the consignee. no nationality and is therefore a stateless vessel, in accordance with international law. 2. The activities set out in paragraph 1 shall be considered as serious infringements in accordance with Article 42 depending on the gravity of the infringement in question which shall be determined by the competent authority of the Member State, taking into account the criteria such as the damage done, its value, the extent of the infringement or its repetition. 1. With a view to prevent, deter and eliminate IUU fishing, an effective scheme of inspections in port for third country fishing vessels calling at the ports of Member States shall be maintained. 2. Access to ports of Member States, the provision of port services, and the conduct of landing or transhipment operations in such ports shall be prohibited for third country fishing vessels unless they meet the requirements laid down in this Regulation, except in cases of force majeure or distress within the meaning of Article 18 of the Unclos (force majeure or distress) for services strictly necessary to remedy those situations. 3. Transhipments between third country fishing vessels or between the latter and fishing vessels flying the flag of a Member State shall be prohibited in Community waters and shall take place only in port, in accordance with the provisions of this Chapter. 4. Fishing vessels flying the flag of a Member State shall not be authorised to tranship at sea catches from third country fishing vessels outside Community waters unless the fishing vessels are registered as carrier vessels under the auspices of a regional fisheries management organisation. 1. Member States shall designate ports, or places close to the shore, where landings or transhipment operations of fishery products and port services referred to in Article 4(2) are permitted. 2. Access to port services and the conduct of landing or transhipment operations by third country fishing vessels shall be authorised only in designated ports. 3. Member States shall transmit to the Commission no later than 15 January of each year a list of designated ports. Any subsequent changes to this list shall be notified to the Commission at least 15 days before the change takes effect. 4. The Commission shall, without delay, publish the list of designated ports in the Official Journal of the European Union and on its website. the quantities for each species to be landed or transhipped. Masters of third country fishing vessels or their representatives shall be exempted from notifying information contained in points (a), (c), (d), (g) and (h), where a catch certificate has been validated in accordance with Chapter III for the full catch to be landed or transhipped in the territory of the Community. 2. The notification set out in paragraph 1 shall be accompanied by a catch certificate validated in accordance with Chapter III if the third country fishing vessel carries on board fishery products. The provisions laid down in Article 14 on the recognition of catch documents or port State control forms which are part of catch documentation or port State control schemes adopted by regional fisheries management organisations shall apply mutatis mutandis. 3. The Commission, in accordance with the procedure referred to in Article 54(2), may exempt certain categories of third country fishing vessels from the obligation stipulated in paragraph 1 for a limited and renewable period, or make provision for another notification period taking into account, inter alia, the type of fishery product, the distance between the fishing grounds, landing places and ports where the vessels in question are registered or listed. 4. This Article shall apply without prejudice to special provisions set forth in fisheries agreements concluded between the Community and third countries. 1. Without prejudice to point 5 of Article 37, a third country fishing vessel shall be granted authorisation to access the port only if the information set out in Article 6(1) is complete and, if the third country vessel carries on board fishery products, is accompanied by the catch certificate referred to in Article 6(2). 2. Authorisation to commence landing or transhipment operations in port shall be subject to a check to determine the completeness of the information submitted as prescribed in paragraph 1 and, where appropriate, to an inspection carried out in accordance with Section 2. 3. By way of derogation to paragraphs 1 and 2 of this Article the port Member State may authorise port access and all or part of a landing in cases where the information set out in Article 6(1) is not complete or its check or verification is pending, but shall, in such cases, keep the fishery products concerned in storage under the control of the competent authorities. The fishery products shall only be released to be sold, taken over or transported once the information set out in Article 6(1) has been received or the checking or verification process is completed. If this process is not completed within 14 days of the landing, the port Member State may confiscate and dispose of the fishery products in accordance with national rules. The cost of storage shall be borne by the operators. 1. Masters of third country fishing vessels or their representative shall submit to the authorities of the Member State whose designated ports of landing or transhipment facilities they use, if possible by electronic means prior to landing or transhipment operations, a declaration indicating the quantity of fishery products by species to be landed or transhipped, and the date and place of each catch. Masters and their representatives shall be held responsible for the accuracy of such declarations. 2. Member States shall keep the originals of the declarations set out in paragraph 1, or a hard copy when transmitted electronically, for a period of three years or longer in accordance with national rules. 3. Landing and transhipment declaration procedures and forms shall be determined in accordance with the procedure referred to in Article 54(2). 4. Member States shall notify the Commission by computer transmission before the end of the first month of each calendar quarter of the quantities landed and/or transhipped by third country fishing vessels in their ports during the previous quarter. 1. Member States shall carry out inspections in their designated ports of at least 5 % of landing and transhipment operations by third country fishing vessels each year, in accordance with the benchmarks determined by the procedure referred to in Article 54(2) on the basis of risk management, without prejudice to the higher thresholds adopted by regional fisheries management organisations. fishing vessels appearing in a IUU vessel list adopted by a regional fisheries management organisation notified to Member States in accordance with Article 30. 1. Officials in charge of inspections (officials) shall be able to examine all relevant areas, decks and rooms of the fishing vessel, catches processed or not, nets or other gear, equipment and any relevant documents which officials deem it necessary to verify in compliance with applicable laws, regulations or international management and conservation measures. Officials may also question persons deemed to have information on the matter subject to inspection. 2. Inspections shall involve the monitoring of the entire landing or transhipment operations and include a cross-check between the quantities by species recorded in the prior notice of landing and the quantities by species landed or transhipped. 3. Officials shall sign their inspection report in the presence of the master of the fishing vessel, who shall have the right to add or cause to be added any information that he considers relevant. Officials shall indicate in the logbook that an inspection has been made. 4. A copy of the inspection report shall be handed over to the master of the fishing vessel, who may forward it to the owner. 5. The master shall cooperate with and assist in the inspections of the fishing vessel and shall not obstruct, intimidate or interfere with the officials in the performance of their duties. immediately forward the inspection report to the competent authority. 2. If the results of the inspection provide evidence that a third country fishing vessel has engaged in IUU fishing in accordance with the criteria set out in Article 3, the competent authority of the port Member State shall not authorise such vessels to land or tranship their catch. 3. The inspecting Member State shall immediately notify its decision not to authorise landing or transhipment operations taken in accordance with paragraph 2, accompanied by a copy of the inspection report, to the Commission or to a body designated by it, which shall immediately transmit it to the competent authority of the flag State of the inspected fishing vessel with a copy to the flag State or States of donor vessels where the inspected fishing vessel has engaged in transhipment operations. Where appropriate, a copy of the notification shall also be communicated to the Executive Secretary of the regional fisheries management organisation in whose area of competence the catch was made. 4. Where the suspected breach has taken place in the high seas, the port Member State shall cooperate with the flag State in carrying out an investigation into it and, where appropriate, shall apply the sanctions provided for by the legislation of that port Member State, under the condition that, in accordance with international law, that flag State has expressly agreed to transfer its jurisdiction. In addition, where the suspected breach has taken place in the maritime waters of a third country, the port Member State shall also cooperate with the coastal State in carrying out an investigation into it and, where appropriate, shall apply the sanctions provided for by the legislation of that port Member State, under the condition that, in accordance with international law, that coastal State has expressly agreed to transfer its jurisdiction. 1. The importation into the Community of fishery products obtained from IUU fishing shall be prohibited. 2. To ensure the effectiveness of the prohibition established in paragraph 1, fishery products shall only be imported into the Community when accompanied by a catch certificate in conformity with this Regulation. 3. The catch certificate referred to in paragraph 2 shall be validated by the flag State of the fishing vessel or fishing vessels which made the catches from which the fishery products have been obtained. It shall be used to certify that such catches have been made in accordance with applicable laws, regulations and international conservation and management measures. 4. The catch certificate shall contain all the information specified in the specimen shown in Annex II, and shall be validated by a public authority of the flag State with the necessary powers to attest the accuracy of the information. In agreement with flag States, within the framework of the cooperation set out in Article 20(4), the catch certificate may be established, validated or submitted by electronic means or be replaced by electronic traceability systems ensuring the same level of control by authorities. 5. The list in Annex I of the products excluded from the scope of implementation of the catch certificate may be reviewed each year on the basis of the results of the information gathered under Chapters II, III, IV, V, VIII, X and XII, and amended in accordance with the procedure referred to in Article 54(2). 1. Catch documents, and any related documents, validated in conformity with catch documentation schemes adopted by a regional fisheries management organisation which are recognised as complying with the requirements laid down in this Regulation, shall be accepted as catch certificates in respect of the fishery products from species to which such catch documentation schemes apply and shall be subject to the check and verification requirements incumbent upon the Member State of importation in accordance with Articles 16 and 17 and to the provisions on refusal of importation laid down in Article 18. The list of such catch documentation schemes shall be determined in accordance with the procedure referred to in Article 54(2). 2. Paragraph 1 shall apply without prejudice to the specific regulations in force whereby such catch documentation schemes are implemented into Community law. documented evidence that the fishery products did not undergo operations other than unloading, reloading or any operation designed to preserve them in good and genuine condition, and remained under the surveillance of the competent authorities in that third country. indicating the conditions under which the fishery products remained in that third country. Where the species concerned are subject to a regional fisheries management organisation catch documentation scheme which has been recognised under Article 13, the documents referred to above may be replaced by the re-export certificate of that catch documentation scheme, provided that the third country has fulfilled its notification requirements accordingly. 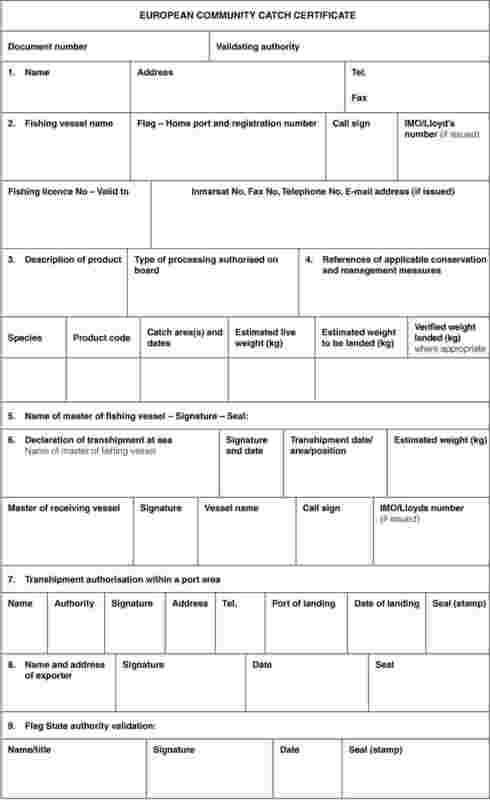 a copy of the original catch certificate(s), where part of the catches concerned has been used for the processing of the fishery products exported in a single consignment. Where the species concerned are subject to a regional fisheries management organisations catch documentation scheme which has been recognised under Article 13, the statement may be replaced by the re-export certificate of that catch documentation scheme, provided that the third country of processing has fulfilled its notification requirements accordingly. 3. The documents and the statement set out in paragraphs (1)(b) and (2) of this Article respectively may be communicated by electronic means within the framework of the cooperation laid down in Article 20(4). 1. The exportation of catches made by fishing vessels flying the flag of a Member State shall be subject to the validation of a catch certificate by the competent authorities of the flag Member State, as established in Article 12(4), if required within the framework of the cooperation laid down in Article 20(4). 2. Flag Member States shall notify to the Commission their competent authorities for the validation of the catch certificates referred to in paragraph 1. 1. The validated catch certificate shall be submitted by the importer to the competent authorities of the Member State in which the product is intended to be imported at least three working days before the estimated time of arrival at the place of entry into the territory of the Community. The deadline of three working days may be adapted according to the type of fishery product, the distance to the place of entry into the territory of the Community or the transport means used. Those competent authorities shall, on the basis of risk management, check the catch certificate in the light of the information provided in the notification received from the flag State in accordance with Articles 20 and 22. 2. 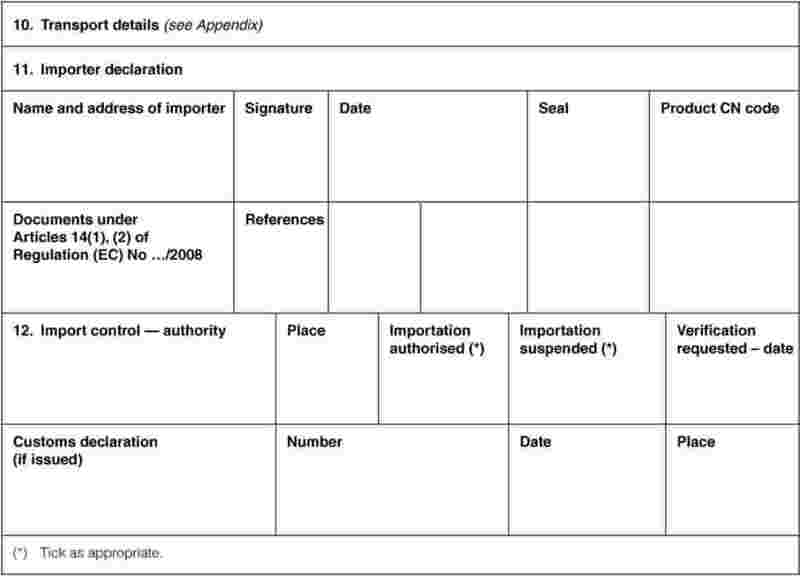 By way of derogation to paragraph 1, importers who have been granted the status of approved economic operator may advise the competent authorities of the Member State of the arrival of the products within the deadline referred to in paragraph 1 and keep the validated catch certificate and related documents as referred to in Article 14 available to the authorities for the purposes of checks in accordance with paragraph 1 of this Article or verifications in accordance with Article 17.
where appropriate, proven financial solvency. Member States shall communicate to the Commission the name and address of the approved economic operators as soon as possible after having granted this status. The Commission shall make available this information to the Member States by electronic means. The rules relating to the status of approved economic operator may be determined in accordance with the procedure referred to in Article 54(2). 1. The competent authorities of the Member States may carry out all of the verifications they deem necessary to ensure that the provisions of this Regulation are correctly applied. 2. Verifications may, in particular, consist in examining the products, verifying declaration data and the existence and authenticity of documents, examining the accounts of operators and other records, inspecting means of transport, including containers and storage places of the products and carrying out official enquiries and other similar acts, in addition to the inspection of fishing vessels at port under Chapter II. 3. Verifications shall be focused towards risk identified on the basis of criteria developed at national or Community level under risk management. Member States shall notify to the Commission their national criteria within 30 working days after 29 October 2008 and update this information. The Community criteria shall be determined in accordance with the procedure referred to in Article 54(2). an alert notice has been published pursuant to Article 23(1). 5. Member States may decide to carry out verifications at random, in addition to the verifications referred to in paragraphs 3 and 4.
the procedure for verification shall be completed within 15 days of the date of the verification request. In the event that the competent authorities of the flag State concerned cannot meet the deadline, the verifying authorities in the Member State may, on request by the flag State or by a third country other than the flag State as referred to in Article 14 grant an extension of the deadline to reply, which shall not exceed a further 15 days. 7. The release of the products onto the market shall be suspended while awaiting the results of the verification procedures referred to in paragraphs (1) to (6). The cost of storage shall be borne by the operator. 8. Member States shall notify to the Commission their competent authorities for the checks and verifications of the catch certificates in accordance with Article 16 and paragraphs (1) to (6) of this Article. the catch certificate has been validated by the authorities of a flag State identified as a non-cooperating State in accordance with Article 31.
they have received a reply which does not provide pertinent answers to the questions raised in the request. 3. In the event that the importation of fishery products is refused pursuant to paragraphs 1 or 2, Member States may confiscate and destroy, dispose of or sell such fishery products in accordance with national law. The profits from the sale may be used for charitable purposes. 4. Any person shall have the right to appeal against decisions taken by the competent authorities pursuant to paragraphs 1, 2 or 3 which concern him. The right of appeal shall be exercised according to the provisions in force in the Member State concerned. 5. The competent authorities of the Member States shall notify the flag State and, where appropriate, the third country other than the flag State as referred to in Article 14 of refusals of importation. A copy of the notification shall be sent to the Commission. 1. Where, at the point of entry into the territory of the Community, fishery products are placed under a transit procedure and transported to another Member State where they shall be placed into another customs procedure, the provisions of Articles 17 and 18 shall be implemented in that Member State. 2. Where, at the point of entry into the territory of the Community, fishery products are placed under a transit procedure and transported to another place in the same Member State where they shall be placed under another customs procedure, that Member State may implement the provisions of Articles 16, 17 and 18 at the point of entry or at the place of destination. Member States shall, as soon as possible, notify to the Commission the measures adopted for the implementation of this paragraph and update this information. The Commission shall publish these notifications on its website. 3. Where, at the point of entry into the territory of the Community, fishery products are transhipped and transported by sea to another Member State, the provisions of Articles 17 and 18 shall be implemented in that Member State. 4. The Member States of transhipment shall communicate to the Member States of destination the information taken from the transport documentation on the nature of the fishery products, their weight, the port of loading and the shipper in the third country, the names of the transport vessels and the ports of transhipment and destination, as soon as possible this information is known and prior to the anticipated date of arrival in the port of destination. its public authorities are empowered to attest the veracity of the information contained in catch certificates and to carry out verifications of such certificates on request from the Member States. The notification shall also include the necessary information to identify those authorities. 2. The information to be given in the notification laid down in paragraph 1 is set forth in Annex III. 3. The Commission shall inform the flag State of the receipt of the notification sent pursuant to paragraph 1. If all elements mentioned in paragraph 1 are not provided by the flag State, the Commission shall indicate to the flag State which elements are missing and request that it provide a new notification. 4. The Commission shall, where appropriate, cooperate administratively with third countries in areas pertaining to the implementation of the catch certification provisions of this Regulation, including the use of electronic means to establish, validate or submit the catch certificates and, where appropriate, documents referred to in Article 14(1) and 14(2). provide for the establishment of a framework for the exchange of information between the two sides in support of the implementation of the cooperation arrangement. 5. The cooperation laid down in paragraph 4 shall not be construed as a precondition for the application of this Chapter to imports originating from catches made by fishing vessels flying the flag of any State. 1. 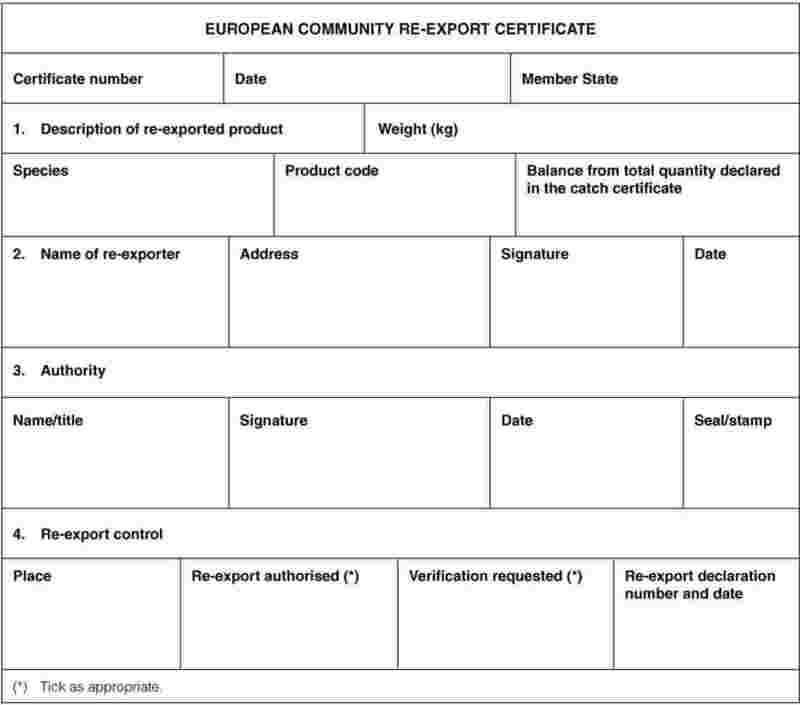 The re-exportation of products imported under a catch certificate in accordance with this Chapter shall be authorised through the validation by the competent authorities of the Member State from which the re-exportation is to take place of the section ‘re-export’ of the catch certificate or a copy thereof where the fishery products to be re-exported are a part of the products imported. 2. The procedure defined in Article 16(2) shall apply mutatis mutandis where the fishery products are re-exported by an approved economic operator. 3. Member States shall notify to the Commission their competent authorities for the validation and the verification of the section ‘re-export’ of catch certificates in accordance with the procedure defined in Article 15.
flag States for which notifications have been received in accordance with Article 20(1), indicating those for which cooperation with third countries has been established in accordance with Article 20(4). 2. The Commission shall publish on its website and in the Official Journal of the European Union the list of States and their competent authorities referred to in paragraph 1, and shall regularly update this information. The Commission shall make the details of the flag States authorities in charge of the validation and the verification of catch certificates available by electronic means to the authorities in the Member States responsible for the validation and verification of catch certificates. 3. The Commission shall publish on its website and in the Official Journal of the European Union the list of the catch documentation schemes which are recognised in accordance with Article 13 and shall update it on a regular basis. 4. Member States shall keep originals of the catch certificates submitted for importation, the catch certificates validated for exportation and the validated re-export sections of catch certificates for a period of three years or longer, in accordance with national rules. 5. Approved economic operators shall keep the original of the documents referred to in paragraph 4 for a period of three years or longer, in accordance with national rules. 1. Where information obtained in accordance with Chapters II, III, V, VI, VII, VIII, X or XI raises well-founded doubt as to the compliance, by fishing vessels or fishery products from certain third countries, with applicable laws or regulations, including applicable laws or regulations communicated by third countries under the administrative cooperation referred to in Article 20(4), or with international conservation and management measures, the Commission shall publish an alert notice on its website and in the Official Journal of the European Union to warn operators and to ensure that Member States take appropriate measures in respect of the third countries concerned pursuant to this Chapter. 2. The Commission shall communicate the information referred to in paragraph 1 without delay to the Member States' authorities and to the flag State concerned and, where appropriate, to a third country other than the flag State as referred to in Article 14.
submit the fishing vessels which fall within the scope of the alert notice, in accordance with the rules of international law, to the necessary enquiries, investigations or inspections at sea, in ports or any other landing places. 2. Member States shall communicate to the Commission as soon as possible the conclusions of their verifications and requests for verification and the actions taken where non-compliance with applicable laws, regulations or international conservation and management measures has been established. advise Member States through appropriate channels. where appropriate, refer the matter to the regional fisheries management organisation whose conservation and management measures might have been violated. any other relevant information obtained, inter alia, in the ports and on the fishing grounds. 2. Member States may, at any time, submit to the Commission any additional information which might be relevant for the establishment of the Community IUU vessel list. The Commission, or a body designated by it, shall circulate the information, together with all the evidence provided, to the Member States and to the flag States concerned. 3. The Commission, or a body designated by it, shall keep a file in respect of each fishing vessel reported as allegedly involved in IUU fishing which shall be updated as new information is obtained. 1. The Commission shall identify fishing vessels for which sufficient information has been obtained in accordance with Article 25 to presume that such fishing vessels may be engaged in IUU fishing, warranting an official enquiry with the flag State concerned. advise the flag State on the provisions in Chapters VI and VII. ask the flag Member State to notify the owner and, where appropriate, the operator of the fishing vessel concerned of the detailed statement of reasons for the intended listing and of the consequences which would result should the vessel be included in the Community IUU vessel list, as laid down in Article 37. Flag Member States shall also be requested to provide information to the Commission as to the fishing vessel's owners and, where appropriate, operators so as to ensure that such persons can be heard, in accordance with Article 27(2). 4. The Commission shall circulate the information on fishing vessels presumed to be engaged in IUU fishing to all Member States in order to facilitate the implementation of Regulation (EEC) No 2847/93. 1. The Commission shall, in accordance with the procedure referred to in Article 54(2), establish a Community IUU vessel list. The list shall include the fishing vessels in relation to which, further to the measures taken pursuant to Articles 25 and 26, the information obtained in accordance with this Regulation establishes that they are engaged in IUU fishing and whose flag States have not complied with the official requests referred to in Article 26(2)(b) and (c) and Article 26(3)(b) and (c), in response to such IUU fishing. 2. Before placing any fishing vessel on the Community IUU vessel list, the Commission shall provide the owner and, where appropriate, the operator of the fishing vessel concerned with a detailed statement of reasons for the intended listing and with all elements supporting the suspicion that the fishing vessel has carried out IUU fishing. The statement shall mention the right to ask for or to provide additional information, and give the owner, and, where appropriate, the operator the possibility of being heard and to defend their case, leaving them adequate time and facilities. 3. When a decision is taken to place a fishing vessel on the Community IUU vessel list, the Commission shall notify that decision, and the reasons for it, to the owner and, where appropriate, the operator of the fishing vessel. 4. The obligations imposed on the Commission by paragraphs 2 and 3 shall apply without prejudice to the primary responsibility of the flag State over the fishing vessel, and only in so far as the relevant information on the identification of the fishing vessel owner and operator is at the disposal of the Commission. 5. The Commission shall notify the flag State of the inclusion of the fishing vessel on the Community IUU vessel list and shall provide the flag State with the detailed reasons for listing. take all the necessary measures to eliminate IUU fishing, including, if necessary, the withdrawal of the registration or the fishing licences of the fishing vessels concerned, and to inform the Commission of the measures taken. 7. This Article shall not apply to Community fishing vessels if the flag Member State has taken action in accordance with paragraph 8. 8. Community fishing vessels shall not be included in the Community IUU vessel list if the flag Member State has taken action pursuant to this Regulation and Regulation (EEC) No 2847/93 against breaches constituting serious infringements as laid down in Article 3(2), without prejudice to the action taken by regional fisheries management organisations. proportionate, dissuasive and effective sanctions have been applied in response to the IUU fishing activities in question, notably for the fishing vessels flying the flag of a Member State in accordance with the Regulation (EEC) No 2847/93. 2. The owner or, where appropriate, the operator of a fishing vessel placed on the Community IUU vessel list may submit a request to the Commission to review the status of that vessel in case of inaction by the flag State under paragraph 1.
the listed fishing vessel has sunk or has been scrapped. the fishing vessel concerned, its owner or operator, maintain no operational or financial links, whether direct or indirect, with any other vessel, owner or operator presumed or confirmed to be engaged in IUU fishing. summary of activities which justify inclusion of the vessel on it, together with references to all relevant documents informing of and evidencing those activities. 2. The Commission shall publish the Community IUU vessel list in the Official Journal of the European Union and shall take any measure necessary to ensure its publicity, including by placing it on its website. 3. The Commission shall update every three months the Community IUU vessel list and shall provide for a system to automatically notify updates to Member States, regional fisheries management organisations and any member of the civil society that should so request. Furthermore, the Commission shall transmit the list to the FAO and to regional fisheries management organisations for the purposes of enhancing cooperation between the Community and these organisations aimed at preventing, deterring and eliminating IUU fishing. 1. In addition to the fishing vessels referred to in Article 27, fishing vessels included in the IUU vessel lists adopted by regional fisheries management organisations shall be included in the Community IUU vessel list, in accordance with the procedure referred to in Article 54(2). Removal of such vessels from the Community IUU vessel list shall be governed by the decisions taken with regard to them by the relevant regional fisheries management organisation. 2. The Commission shall each year, on receiving from regional fisheries management organisations the lists of fishing vessels presumed or confirmed to be involved in IUU fishing, notify them to the Member States. 3. The Commission shall notify promptly to the Member States any addition to, any deletion from and/or any modification of the lists referred to in paragraph 2 of this Article at any time such changes occur. Article 37 shall apply in respect of the vessels appearing on the regional fisheries management organisations IUU vessel lists so modified as of the time of their notification to Member States. 1. The Commission, in accordance with the procedure referred to in Article 54(2), shall identify the third countries that it considers as non-cooperating third countries in fighting IUU fishing. 2. The identification set out in paragraph 1 shall be based on the review of all information obtained pursuant to Chapters II, III, IV, V, VIII, X and XI, or, as appropriate, any other relevant information, such as the catch data, trade information obtained from national statistics and other reliable sources, vessel registers and databases, catch documents or statistical document programmes and IUU vessel lists adopted by regional fisheries management organisations, as well as any other information obtained in the ports and on the fishing grounds. 3. A third country may be identified as a non-cooperating third country if it fails to discharge the duties incumbent upon it under international law as flag, port, coastal or market State, to take action to prevent, deter and eliminate IUU fishing. access of fisheries products stemming from IUU fishing to its market. for developing countries, the existing capacity of their competent authorities. any act or omission by the third country concerned that may have diminished the effectiveness of applicable laws, regulations or international conservation and management measures. 7. Where appropriate, specific constraints of developing countries, in particular in respect to monitoring, control and surveillance of fishing activities, shall be duly taken into consideration in the implementation of this Article. the consequences of its identification as non-cooperating third country, as provided in Article 38. 2. The Commission shall also include in the notification referred to in paragraph 1 a request that the third country concerned take any necessary measures for the cessation of the IUU fishing activities in question and the prevention of any future such activities, and rectify any act or omission referred to in Article 31(6)(c). 3. The Commission shall, by more than one means of communication, transmit its notification and request to the third country concerned. The Commission shall seek to obtain confirmation from that country that it has received the notification. 4. The Commission shall give to the third country concerned adequate time to answer the notification and a reasonable time to remedy the situation. 1. The Council, acting by qualified majority on a proposal from the Commission, shall decide on a list of non-cooperating third countries. 2. The Commission shall, without delay, notify the third country concerned of its identification as a non-cooperating third country and of the measures applied in accordance with Article 38, and shall request it to rectify the current situation and to advise on the measures taken to ensure compliance with conservation and management measures by its fishing vessels. 3. Following a decision taken pursuant to paragraph 1 of this Article, the Commission shall, without delay, notify it to the Member States and shall request them to ensure the immediate implementation of the measures laid down in Article 38. Member States shall notify the Commission of any measures they have taken in response to this request. 1. The Council, acting by qualified majority on a proposal from the Commission, shall remove a third country from the list of non-cooperating third countries if the third country concerned demonstrates that the situation that warranted its listing has been rectified. A removal decision shall also take into consideration whether the identified third countries concerned have taken concrete measures capable of achieving a lasting improvement of the situation. 2. Following a decision taken pursuant to paragraph 1 of this Article, the Commission shall, without delay, notify Member States of the lifting of the measures laid down in Article 38 in respect of the third country concerned. The Commission shall publish the list of non-cooperating third countries in the Official Journal of the European Union and take any measure necessary to ensure publicity of this list, including placing it on its website. The Commission shall regularly update the list and shall provide for a system to automatically notify updates to Member States, regional fisheries management organisations and any member of the civil society that should so request. Furthermore, the Commission shall transmit the list of non-cooperating third countries to the FAO and to regional fisheries management organisations for the purposes of enhancing cooperation between the Community and those organisations aimed at preventing, deterring and eliminating IUU fishing. 1. If there is evidence that the measures adopted by a third country undermine the conservation and management measures adopted by a regional fisheries management organisation, the Commission shall be entitled to adopt, in line with its international obligations, emergency measures which shall last no more than six months. The Commission may take a new decision to extend the emergency measures for no more than six months. live fish caught by fishing vessels flying the flag of the third country concerned shall not be accepted for the purposes of fish farming in maritime waters under the jurisdiction of a Member State. 3. Emergency measures shall have immediate effect. They shall be notified to the Member States and to the third country concerned and published in the Official Journal of the European Union. 4. The Member States concerned may refer the Commission's decision set out in paragraph 1 to the Council within 10 working days of receipt of the notification. IUU fishing vessels with no fish and crew on board shall be authorised to enter a port for its scrapping, but without prejudice to any prosecutions and sanctions imposed against that vessel and any legal or natural person concerned. the Commission shall not enter into negotiations to conclude a bilateral fisheries agreement or fisheries partnership agreements with such countries. 1. Nationals subject to the jurisdiction of Member States (nationals) shall neither support nor engage in IUU fishing, including by engagement on board or as operators or beneficial owners of fishing vessels included in the Community IUU vessel list. 2. Without prejudice to the primary responsibility of the flag State, Member States shall cooperate amongst themselves and with third countries and take all appropriate measures, in accordance with national and Community law, in order to identify nationals supporting or engaged in IUU fishing. 3. Without prejudice to the primary responsibility of the flag State, Member States shall take appropriate action, subject to and in accordance with their applicable laws and regulations with regard to nationals identified as supporting or engaged in IUU fishing. 4. Each Member State shall notify to the Commission the names of the competent authorities responsible for coordinating the collection and verification of information on activities of nationals referred to in this Chapter and for reporting to and cooperating with the Commission. 1. Member States shall encourage nationals to notify any information pertaining to legal, beneficial or financial interests in, or control of, fishing vessels flagged to a third country which they hold and the names of the vessels concerned. 2. Nationals shall not sell or export any fishing vessel to operators involved in the operation, management or ownership of fishing vessels included in the Community IUU vessel list. 3. Without prejudice to other provisions laid down in Community law pertaining to public funds, Member States shall not grant any public aid under national aid regimes or under Community funds to operators involved in the operation, management or ownership of fishing vessels included in the Community IUU vessel list. 4. Member States shall endeavour to obtain information on the existence of any arrangement between nationals and a third country allowing the reflagging of fishing vessels flying their flag to such third country. They shall inform the Commission thereof by submitting a list of the fishing vessels concerned. serious infringements detected within the territory or within waters as referred to in point 1 of this Article but which have been committed on the high seas or within the jurisdiction of a third country and are being sanctioned pursuant to Article 11(4). the falsification of documents referred to in this Regulation or the use of such false or invalid documents. 2. The serious character of the infringement shall be determined by the competent authority of a Member State taking into account the criteria set out in Article 3(2). the suspension of the authorisation to fish. 2. The enforcement measures shall be of such nature as to prevent the continuation of the serious infringement concerned and to allow the competent authorities to complete its investigation. 1. Member States shall ensure that a natural person having committed or a legal person held liable for a serious infringement is punishable by effective, proportionate and dissuasive administrative sanctions. 2. The Member States shall impose a maximum sanction of at least five times the value of the fishery products obtained by committing the serious infringement. In case of a repeated serious infringement within a five-year period, the Member States shall impose a maximum sanction of at least eight times the value of the fishery products obtained by committing the serious infringement. In applying these sanctions the Member States shall also take into account the value of the prejudice to the fishing resources and the marine environment concerned. 3. Member States may also, or alternatively, use effective, proportionate and dissuasive criminal sanctions. the suspension or withdrawal of the status of approved economic operator granted pursuant to Article 16(3). The overall level of sanctions and accompanying sanctions shall be calculated in such way as to make sure that they effectively deprive those responsible of the economic benefits derived from their serious infringements without prejudice to the legitimate right to exercise a profession. For this purpose, account shall be also taken of immediate enforcement measures taken pursuant to Article 43. 2. A legal person may be held liable where the lack of supervision or control, by a natural person referred to in paragraph 1, has made possible the commission of a serious infringement for the benefit of that legal person by a natural person under its authority. 3. Liability of a legal person shall not exclude proceedings against natural persons who are perpetrators, instigators or accessories in the infringements concerned. 1. The provisions of this Chapter shall apply to fishing activities subject to the rules on sightings at sea adopted within regional fishery management organisations which are binding to the Community. 2. In the event that a Member State's competent authority responsible for inspection at sea sights a fishing vessel engaged in activities that may be considered as IUU fishing, it shall forthwith issue a report of the sighting. Such report and the results of investigations carried out on that fishing vessel by that Member State shall be considered evidence for use in the implementation of the identification and enforcement mechanisms provided in this Regulation. any other relevant information regarding the observed activities of the fishing vessel concerned. 4. Sighting reports shall be sent without delay to the competent authority of the flag Member State of the sighting fishing vessel, which shall transmit them as soon as possible to the Commission or to the body designated by it. The Commission or the body designated by it shall then immediately inform the flag State of the fishing vessel sighted. The Commission or a body designated by it shall thereupon transmit the sighting report to all the Member States and, as appropriate, to the Executive Secretary of the relevant regional fisheries management organisations for further action in accordance with the measures adopted by those organisations. 5. A Member State which receives a sighting report reporting the activities of a fishing vessel flying its flag from the competent authority of a contracting party of a regional fisheries management organisation shall notify the report and all relevant information as soon as possible to the Commission or to the body designated by it, which shall thereupon forward this information to the Executive Secretary of the regional fisheries management organisation concerned for further action in accordance with the measures adopted by this organisation, as appropriate. 6. This Article shall apply without prejudice to stricter provisions adopted by regional fisheries management organisations to which the Community is a contracting party. 1. Member States which obtain suitably documented information regarding sighted fishing vessels shall transmit this information without delay to the Commission or to the body designated by it with the format determined in accordance with the procedure referred to in Article 54(2). 2. The Commission or the body designated by it shall also examine suitably documented information regarding sighted fishing vessels submitted by citizens, civil society organisations, including environmental organisations, as well as representatives of fisheries or fish trade stakeholder interests. 1. Member States shall, as soon as possible, initiate an investigation on the activities of fishing vessels flying their flag which have been sighted in accordance with Article 49. 2. Member States shall notify, where possible by electronic means, to the Commission or the body designated by it the details of the initiation of the investigation and of any action taken or intended in respect of the sighted fishing vessels flying their flag, as soon as practicable and in any case within two months of the notification of the sighting report pursuant to Article 48(4). Reports on the progress of the investigations on the activities of the sighted fishing vessel shall be provided to the Commission or to the body designated by it at appropriate regular intervals. A final report on the outcome when the investigations are completed shall be provided to the Commission or to the body designated by it. 3. Member States other than the flag Member State concerned shall, where appropriate, verify whether the sighted fishing vessels reported have carried out activities in maritime waters under their jurisdiction or if fisheries products stemming from those vessels have been landed or imported into their territory and shall investigate their record of compliance with relevant conservation and management measures. Member States shall notify without delay to the Commission, or to the body designated by it, and to the flag Member State concerned the outcome of their verifications and investigations. 4. The Commission or the body designated by it shall communicate to all the Member States the information received in accordance with paragraphs 2 and 3. 5. This Article shall apply without prejudice to the provisions of Chapter V of Regulation (EC) No 2371/2002 and to the provisions adopted by regional fisheries management organisations to which the Community is a contracting party. 1. The administrative authorities responsible for implementation of this Regulation in the Member States shall cooperate with each other, with administrative authorities of third countries and with the Commission in order to ensure compliance with this Regulation. 2. For the purposes of paragraph 1, a system for mutual assistance shall be established, which shall include an automated information system, the ‘IUU fishing information system’, which shall be managed by the Commission or a body designated by it, to assist competent authorities in preventing, investigating and prosecuting IUU fishing. 3. Detailed rules for the application of this Chapter shall be adopted in accordance with the procedure referred to in Article 54(2). The measures necessary for implementing the provisions of this Regulation shall be adopted in accordance with the procedure referred to in Article 54(2). Member States may require the operators concerned to contribute to the costs linked to the implementation of this Regulation. 1. The Commission shall be assisted by the Committee set up under Article 30 of Regulation (EC) No 2371/2002. 1. Every two years, Member States shall transmit a report to the Commission on the application of this Regulation not later than 30 April of the following calendar year. 2. On the basis of the reports submitted by the Member States and its own observations, the Commission shall draw up a report every three years to be submitted to the European Parliament and to the Council. 3. An evaluation of the impact of this Regulation on IUU fishing shall be undertaken by the Commission by 29 October 2013. Articles 28b(2), 28e, 28f, 28g and Article 31(2)(a) of Regulation (EEC) No 2847/93, Regulation (EC) No 1093/94, Regulation (EC) No 1447/1999, Articles 8, 19a, 19b, 19c, 21, 21b, 21c of Regulation (EC) No 1936/2001 and Articles 26a, 28, 29, 30 and 31 of Regulation (EC) No 601/2004 shall be repealed with effect from 1 January 2010. Done at Brussels, 29 September 2008. (1) Opinion delivered on 23 May 2008 (not yet published in the Official Journal). (2) Opinion delivered on 29 May 2008 (not yet published in the Official Journal). Opinion delivered following non-compulsory consultation. (4) OJ L 261, 20.10.1993, p. 1. (7) Council Regulation (EC) No 1093/94 of 6 May 1994 setting the terms under which fishing vessels of a third country may land directly and market their catches at Community ports (OJ L 121, 12.5.1994, p. 3). (8) Council Regulation (EC) No 1447/1999 of 24 June 1999 establishing a list of types of behaviour which seriously infringe the rules of the common fisheries policy (OJ L 167, 2.7.1999, p. 5). (9) Council Regulation (EC) No 1936/2001 of 27 September 2001 laying down control measures applicable to fishing for certain stocks of highly migratory fish (OJ L 263, 3.10.2001, p. 1). (10) Council Regulation (EC) No 601/2004 of 22 March 2004 laying down certain control measures applicable to fishing activities in the area covered by the Convention on the conservation of Antarctic marine living resources (OJ L 97, 1.4.2004, p. 16). (11) OJ L 256, 7.9.1987, p. 1. Where a catch documentation scheme adopted by a regional fishery management organisation has been recognised as a catch certification scheme for the purposes of this Regulation, the flag State notifications made under such catch documentation schemes are deemed to be done in accordance with the provisions laid down in paragraph 1 of this Annex and the provisions of this Annex are deemed to apply mutatis mutandis.